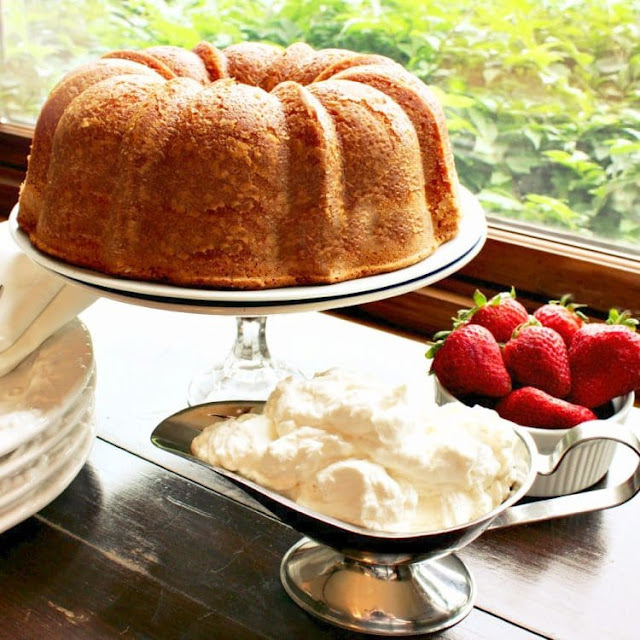 Perfect Pound Cake is buttery and sweet, with a hint of vanilla. This cake is rich, with the flavor of shortbread cookies, but is still light as a feather. Serve with fresh whipped cream and berries as a fancy dessert or brunch dish – can also be made ahead and frozen. Preheat your oven to 325 F. Grease and flour a 12 cup bundt cake pan. In a large mixing bowl add the butter and sugar. On medium speed using a paddle attachment or hand mixer, cream the butter and sugar for about 5 minutes until light and fluffy. Add eggs, one at a time into the mixer, set to medium speed. Beat for 45 seconds after each egg. Add the vanilla to the mixture and beat an additional 30 seconds. In a medium bowl,measure out the flour, baking powder, salt and nutmeg. At low speed, add 1/2 of the dry ingredients to the butter and egg mixture, and beat until just blended. Then add 1/2 the milk and with the mixer still on low, beat the milk in until just blended. Scrape the sides of the bowl with a spatula between mixing in the dry ingredients and the milk. Repeat the process with the remaining half of the dry ingredients and the milk. Pour the batter into the prepared baking pan and fill no more than 2/3 full. Smooth the top with a spoon or spatula. Place the pan into the 325 F preheated oven and bake for 85 minutes or until toothpick inserted in the cake comes out clean and the cake is just starting to pull away from the sides. Remove the cake from the oven and allow to cool about 15 minutes before inverting and removing the cake from the pan. Allow to cool before serving. 0 Response to "perfect pound cake"